Once, hunters were normal people who lived regular lives, just like you and me. That was before. Now that the Messengers have touched them, the imbued recognize the real horrific world ruled by monsters. But who are the Messengers, where did monsters come from and why were these once-blind people chosen to inherit the Earth? The answers lie in the ravings of a madman. 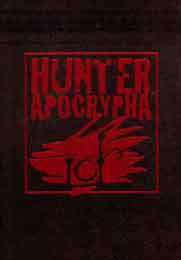 Hunter: Apocrypha is the veritable bible of the imbued, for Hunter: The Reckoning. Following in the tradition of Vampires Book of Nod, this trade-sized, leatherette-bound book captures the omens and portents of one of hunters most crazed yet prophetic minds, and bears the answers to all hunters haunting questions: Why was I chosen? What must I do to save the world? Part of the Year of Revelations series.